Eggplant balls or Polpette di melanzane in italian, is a great appetizer that I learned from my Italian friend. The first time I tasted it I did not guess that it was eggplant. The tender pulp of the eggplant is used to make tasty croquettes. These croquettes are great as a side dish, or on an antipasto platter. 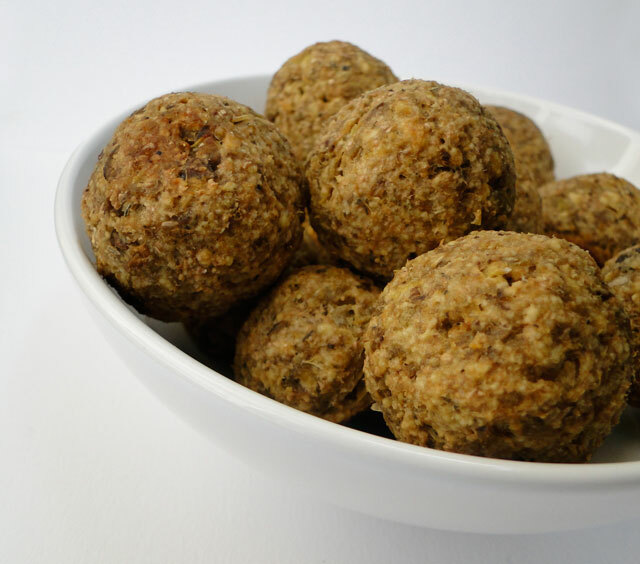 After making them, I have found that I enjoy vegetarian balls even more than meat balls. I sometimes serve them with a Lebanese mezze but you can get fancy and make your own marinara and serve them over spaghetti. In both ways, they're simply delicious. Preheat the oven to 350ºF (180ºC) and lightly grease 2 oven trays. Clean the eggplants, peel them and slice them into disks. Lightly drizzle with olive oil and bake them for 45 mn until golden. Let them cool. In a food processor, finely chop the eggplant. In a bowl mix the onion, garlic, breadcrumbs, basil, parsley, egg and parmesan cheese. Season with salt and pepper. Add the chopped eggplants. Wet your hands with a little water and shape the eggplant mixture into balls. Place them on a non-stick oven tray and bake them for 25 minutes until deep golden brown and slightly crusty. Do not overbake or they will be too dry. Remove tray from oven and cover with foil to let the meatballs steam until ready to serve. Préchauffez votre four à 180ºC. Huilez 2 plaques à four. Lavez les aubergines, pelez-les et coupez les en rondelles. Versez un filet d'huile d'olive et enfournez les environ 45 mn jusqu'à ce qu'elles soient dorées. Une fois refroidies, passez-les au mixer. Dans un saladier, mélangez les onions, l'ail, la chapelure, le persil, l'œuf et le parmesan. Salez et poivrez. Ajoutez les aubergines mixées. Formez des boulettes d'aubergines. Placez-les sur une plaque de four anti-adhésive et enfournez pour 25 mn jsuqu'à ce qu'elles soient légèremnt dorées et croustillantes. Ne pas laissez cuire trop longtemps sinon elles se déssèchent. Faites sortir la plaque du four et couvrez avec du papier aluminium jusqu'au moment de servir. That is interesting! Delicious I'm sure. I love this appetizer. It should be delicious accompanied with a hummus dip. 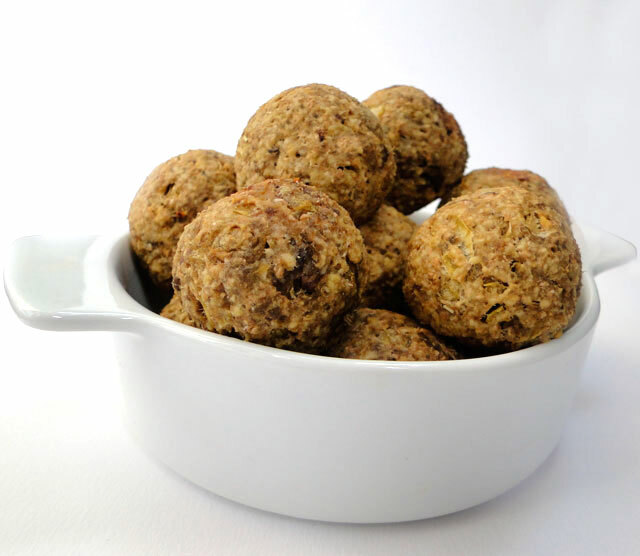 Great idea those vegetarian balls! These look cute & good. You have a nice blog. I love eggplant, its even better fried! These look awesome! 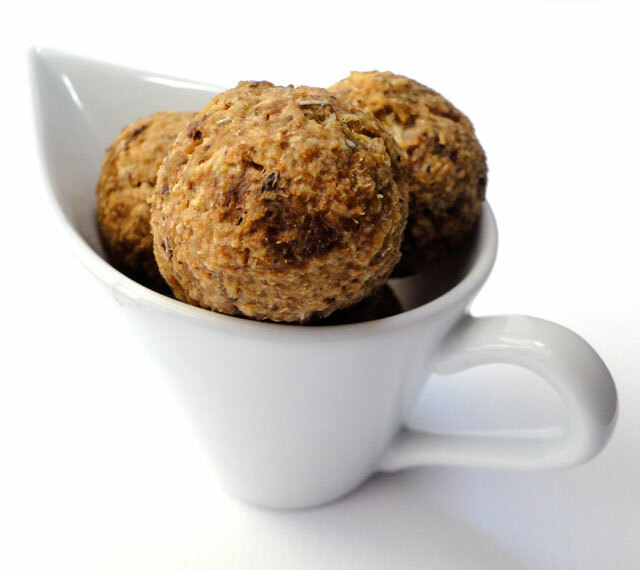 a great alternative to meat polpette! my vegan friends will love me for this! I made some polpette recently! This looks amazing!I saw your site from the foodieblogroll and if you won't mind, I'd love to guide foodista readers to your site.Just add a Foodista widget here at the end of this blog post and it's ready to go.Thanks! I need to make these real soon, love this! hm, j'adore les aubergines et je trouve cette recette très original ! I'm always looking for great new appetizer dishes, these look awesome. I simply love the photographs on your site. I have a blog "award" for you, do stop by to pick it up! Hi Chris, glad you liked them! Hey Chris..Thanks for sharing recipe here..Its looking delicious..I m waiting for further recipes..keep posting..
Merci beaucoup pour cette recette. Les boulettes sont tres tres délicieux !! !